Hole in One: Ilish McGing joined the Castlebar Golf Club Ladies Hole in One club in the Lady President's Day (Rowena Kilkelly) competition. She is pictured with Cora Mulroy (Lady Captain) and Rowena Kilkelly (Lady President) at Castlebar Golf Club. Photo: Michael Donnelly. It was captains prize day in Balla last weekend and Lorcan Cribben was the winner with a score of 113pts, second place went to Shane Foy, the gross to Ronan Mahon and third place to Brian Fallon. The rest of the top seven was completed by Padraic Cresham, Pat Griffith, Eamonn Keane and Derek Reilly. The first 18 went to Mark Killeen and the second 18 to Pat Mohan, the past captain win went to Bob Leggett. The ladies' competition win went to Carmel Costello with Carmel Henry in second place and the gross prize going to Breege Jennings. Patsy Glynn was the winner of the gents' competition with a score of 36pts, he finished just in front of Kevin Henry in second place, with Tom Moran not too far behind in third spot. The ladies' competition was won by Margaret Dyer with a score of 77pts, her play on the back nine saw her edge home in front of Maria Coyne who also finished with a score of 77pts and Claire Lannon finished in third place. The ladies' competition last weekend was won by Gerard Keane with a score of 39pts, she finished one point in front of Helen Healy in second place. Third spot went to Aine Melville and fourth was claimed by Anne Tracey. The front nine prize was claimed by Carmel Maloney and the back nine went to Maura Joyce. The gents' competition was won by Gerard Keane who scored 39pts, Alan Sammon finished in second with Michael Lee winning the gross prize. The category prizes went to Oliver Walsh, Brendan O'Toole and Donagh Greaney. The front nine win went to Mike Fannon and the back nine to Patsy Casey. In the Friday open competition Brian Finnerty won the gents' prize with Darragh Cunningham finishing in second and the gross prize going to Donal Cunningham. The other qualifiers were Peter Ford, Aidan Keane, William Kavanagh and Gerry Donnellan. The ladies' open competition was won by Patricia Leyden with the other qualifiers on the day being Chris Yeats, Helan Healy, Geraldine Ryan and Sarah Staunton. The grand final of the open comeptition takes place today Friday September 14. Betty Gannon was the winner of the Lady President's Prize in Castlebar last weekend with a score of 70, her back nine play saw her just hold off Dolores Towey to take the prize. The gross competition went to Connie White and the rest of the top eight finishers was completed by Mary McKeon, Cora Mulroy, Marian Martyn, Teresa Reddington, Mary Caulfied and Mary Rose McNulty. The past President's prize went to Teresa Kelly, the nine hole stableford was claimed by Brigid Kilkelly, the second and third year beginners section went to Veronica Durcan and the first year beginners to Sophia McHugh. 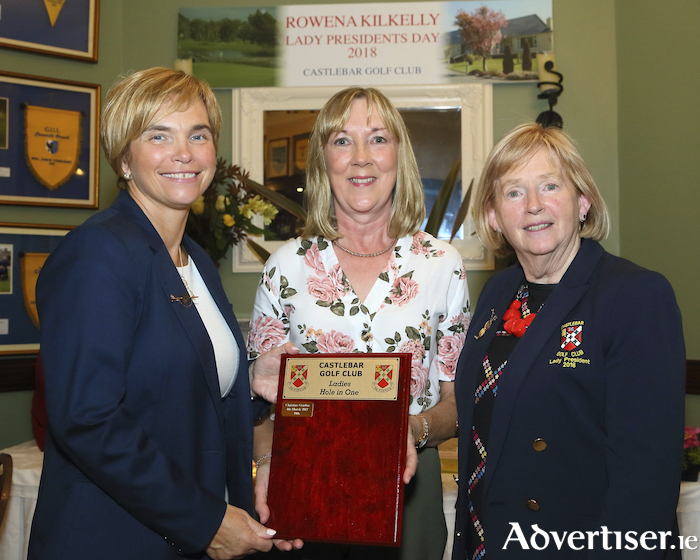 Last Sunday was Presidents' (Mary Gallagher ) Prize Day in Claremorris and the ladies' winner was Carmel Kilgallon with a score of 74nett, second place went to Kate Gallagher, third spot was claimed by Rita Grealish and fourth place went to Catherine McEveney. The nine hole competition was won by Martina Hennelly with the beginners nine hole competition going to Carmel Morley. The gents' prize was won by Brian Cavanagh with a score of 67nett, second place went to Damien Cubbart, third to Liam Newman and the gross prize went home with Thomas Walsh. The other places were completed by Alan Gurren in fourth, Darragh Joyce in fifth and Bert Sexton finished in sixth spot. The Past Presidents prize went to Brendan Kelly and the Birdie competition was won by Peter Coen. Mulranny golfers will take a 5-0 lead to Ballinasloe for the second leg of the Jack O’Sullivan Trophy Connaught Final on Saturday next. The first leg was played in very difficult weather conditions with wind and rain lashing Mulranny links, but the home side adapted better to the adverse conditions and sealed a perfect performance with wins on the 18th in the final two matches. The Mulranny team consisted of Michael Joyce, Alan McAdam, Eugene McCormack, Eamon Mongan, JJ Kelly, Fergus Rothwell, Richard Keane, Shane McDermott, Martin Moylan and Christy McDonnell. This weekend’s stableford competition will be played on Friday and Saturday as the course will be reserved on Sunday for the Grainne Uaile competition. In the gents' stableford competition last weekend James Irwin was the winner with a score of 40pts, Pat Marren finished in second place also with a score of 40pts and Barry Durkan finished in third place with a score of 39pts. The ladies' competition was won by Margaret McNicholas with a score of 32pts, second place went to Dympna O'Donnell two points behind and Mary Horkan finished in third place with 28pts. John F O'Malley was the overall winner of the club competition with a score of 36pts, the category wins went to Paul Moore, Enda McDonagh and Jerry Moran with Matthew Golden winning the gross prize.